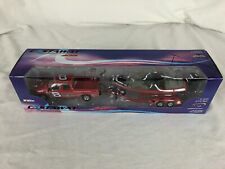 This listing is for the Autographed Kyle Petty Toy Story 2, Buzz Lightyear 1/24 scale NASCAR Diecast Car that is pictured. CHROME PLATED Dale Jarrett #88 UPS Truck & Race Car Employee Exclusive NASCAR. Condition is New. Shipped with USPS First Class Package (2 to 3 business days). 1/32 UPS Package Car that houses a 1/43 NASCAR Stock Car. They are both Chrome Plated. I have only had this out twice, once when I bought it in 2002 and now. I have another non chrome plated set like this up for auction and I combine shipping. 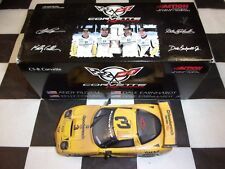 This is a 2001 Corvette C5R raced used version, 1 :43 scale version by Action. We are Ron's Racing Collectibles. We have specialized in NASCAR collectibles for 25 years! Even with our large showroom we are starting to run out of room. I do believe that it was a Avon Exclusive. I will no longer be using the Global Program because I have had complaints about the cost of that service. It only takes a few minutes and its. Action 1/43 Scale car - 2001 #3 GM Goodwrench Service C5R CorvetteRACED VERSION MIB. Drivers - Dale Earnhardt - Andy Pilgrim - Kelly Collins - Dale Earnhardt Jr. Car is new and unused and in Mint/Near Mint condition. DANICA PATRICK # 7 GO DADDY CHEVY. The car has official markings and rubber tires. The under carriage has been hand painted. This Rare one of 5000 Castaway. and Nitro Boat is The Silver Select. 4 door Chevrolet Pickup, Trailer. This 2003 Nitro Boat Trailer and. 4 door Chevrolet Pickup is RARE. Car is out of box but with no blemishes (See Photos). 1999 - Revell Collection / NASCAR - Item # RC439916514 - Coca-Cola 699 - Chevrolet Monte Carlo - Charlotte Motor Speedway 40th Anniversary -. Collector Quality Condition - Fantastic Collectible for the serious collector! Earnhardt Sr., Junior, Andy Pilgrim 24-Hour CORVETTES PRE-RACED & RACED N.O.S. CONDITION--N.O.S. Only out of box for pictures. You are getting both cars. NASCAR `03 ACTION / RCCA COLLECTABLES: DALE JARRETT #88 UPS 1:43 CLUB CAR MIB. • Action Muscle Machines presents the Dale Earnhardt Junior #8 monster truck four-wheel steering four-wheel suspensio n 1:43 scale model. Let us know before hand what is going on. And we will. TAKE CARE OF YO. 2005 was the year which Dale Jarrett piloted this great looking Ford. Car has never been removed from its original box. Box in very good condition. See thru panels on top and sides for ez view. Leave in or take out, it's up to you. Action Performance NASCAR #24 Jeff Gordon Monte Carlo in 1:43 scale from 2002. Die-cast body with molded chassis, tan interior. In perfect condition. Jeremy Mayfield Collectible Cars. 1:43, 1:64 Scale. This Is A Very Rare Winner's Circle Signed By The Driver Nascar Jeff Green #30 AOL Chevy Monte Carlo In A Blue & White 1:43 Scale Diecast With Collector's Cards From Hasbro 2002. 2002 NASCAR WINNER'S CIRCLE #24 JEFF GORDON DOUBLE PLATINUM TEAM COLLECTOR CARD WITH CAR----CHEVROLET--MONTE CARLO---DUPONT 200 YEARS---NEW---FACTORY SEALED---THERE IS A LITTLE SHELF WEAR. As pictured, includes card display. Ships same day if paid on time. This is a 1/64 scale model car driven by Dale Earnhardt. It is a model 1998 Monte Carlo. It was Dale's 25th year in Nascar cup competition. It has never been out of the box and is in great condition.It would make a great addition to any collection. This is a limited edition 1:43 scale Pewter Nascar and was kept as a collectible. Very nice Check out our other items for more great deals ! 1:43 scale diecast of Dale Earnhardt’s 1998 coke Chevrolet. All in original packaging with certificate of authenticity.